On Saturday night, I listened to some of the best counsel that I've heard in a long time. I consider myself a hard one to take counsel--especially from Boy. The times that I share with him my frustrations and raw emotions, he'll outline a plan to try and remedy the situation. He'll also quote scripture and other well meaning advice, and my defenses cut him off by saying, "I know, I know, I know..." He does it out of love, and days after I've steamed off, I'm thankful for it. As independent and self-reliant as I tend to be, I like knowing that he's trying to help me steer into the right direction. He says I'm too hard on myself--and I think that he's right. As one who is more prone to self deprecation than a normal human being, I can be relentless; and although I'm aware of its poisonous effects, I allow it to eat away at me. Shame on me. The counsel I heard came from a man who I met eight years ago in Kirtland, Ohio. I doubt I'll ever forget the genuine greeting he imparted in his thick German accent as he took my hand. His wife was just as charming. Hey, Britt, I'm talking to you...guess what? Everybody has weaknesses. Nobody's perfect! Stop punishing yourself. Forget not the difference between a good sacrifice and a not-as-good (foolish) sacrifice. the golden question I must etch into my brain: "What am I committing my time and energy towards?" Interpretation: when medical school is finished...when intern year Hell is over...when residency is all said and done...when the heinous mountain of student loans are all paid...STOP IT RIGHT NOW! Forget not the why of the gospel of Jesus Christ. in other words, the what and the how mark the way, but the why sanctifies our actions and magnifies our holy acts. Forget not that God loves you. meaning: you are not forgotten--no matter the circumstance. For one like me who esteems myself as a weedy dandelion standing beside so many rich-colored and sweet-smelling flowers, the metaphor of the Forget-Me-Not* is one I hope not to forget. 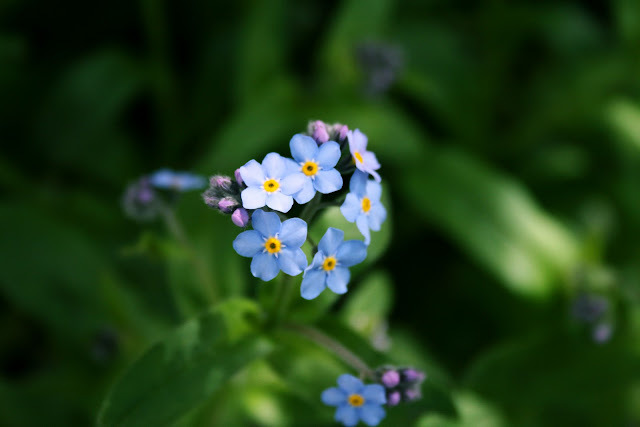 *A story from German folklore tells of God naming all the flowers, when a little one shouted out, "Forget-me-not, O Lord!" "That shall be your name," was God's reply.